The Vietnamese Communists, or Vietcong, were the military branch of the National Liberation Front (NLF), and were commanded by the Central Office for South Vietnam, which was located near the Cambodian border. For arms, ammunition and special equipment, the Vietcong depended on the Ho Chi Minh trail. Other needs were met inside South Vietnam. Main force Vietcong units were uniformed, full-time soldiers, and were used to launch large scale offensives over a wide area. Regional forces were also full-time, but operated only within their own districts. When necessary, small regional units would unite for large scale attacks. If enemy pressure became too great, they would break down into smaller units and scatter. Unlike the main troops, who saw themselves as professional soldiers, local Vietcong groups tended to be far less confident. For the most part, recruits were young teenagers, and while many were motivated by idealism, others had been pressured or shamed into joining. They also harbored real doubts about their ability to fight heavily armed and well-trained American soldiers. Initially, local guerrillas were given only a basic minimum of infantry training, but if they were recruited to a main force unit, they could receive up to a month of advanced instruction. Additionally, there were dozens of hidden centers all over South Vietnam for squad and platoon leader, weapons and radio training. To ensure that the guerrillas understood why they were fighting, all training courses included political instruction. By the mid-1960s, most main force Vietcong troops were armed with Chinese versions of the Russian AK-47 submachine gun. They also used a range of effective Soviet and Chinese light and medium machine guns, and infrequently, heavy machine guns. In particular, heavy machine guns were valued for defense against American helicopters. For destroying armored vehicles or bunkers, the Vietcong had highly effective rocket propelled grenades and recoilless rifles. Mortars were also available in large numbers and had the advantage of being very easy to transport. Many weapons, including booby traps and mines, were homemade in villages. The materials ranged from scavenged tin can to discarded wire, but the most important ingredients were provided by the enemy. In a year, dud American bombs could leave more than 20,000 tons of explosives scattered around the Vietnamese countryside. After air-raids, volunteers retrieved the duds and the dangerous business of creating new weapons began. Local forces also designed primitive weapons, some designed to frighten intruders, but others were extremely dangerous. "Punji traps" -- sharp spikes hidden in pits -- could easily disable an enemy soldier. Punjis were often deliberately contaminated to increase the risk of infection. In December 1965, Ho Chi Minh and the North Vietnamese leadership ordered a change in a way the war in the South was to be fought. From now on, the Vietcong would avoid pitched battles with the Americans unless the odds were clearly in their favor. There would be more hit and run attacks and ambushes. To counter the American build-up, Vietcong recruitment would be stepped up and more North Vietnamese Army troops would be infiltrated into South Vietnam. 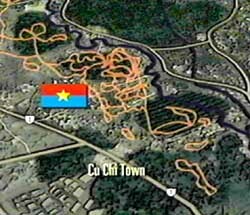 The Vietcong, following the example of Chinese guerillas before them, had always given the highest priority to creating safe base areas. They were training grounds, logistics centers and headquarters. They also offered secure sanctuaries for times when the war might go badly. Hiding the base areas had always been a high priority for the Vietcong. Now, with American spotter planes everywhere, it was more vital than ever to protect them. In remote swamps or forests, there were few problems, but nearer the capital, it was much more difficult. The answer was to build enormous systems of underground tunnels. The orders coming from NLF headquarters were absolutely clear. Tunnels were not to be treated as mere shelters. They were fighting bases capable of providing continuous support for troops. 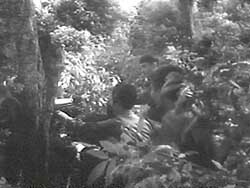 Even if a village was in enemy hands, the NLF beneath were still able to conduct offensive operations. There were complexes big and small scattered across the country. Each villager in a NLF area had to dig three feet of tunnel a day. There was even a standard handbook specifying how tunnels were to be built. The biggest tunnel systems were in the Iron Triangle and the Cu Chi District, only 20 miles from Saigon. The base area at Cu Chi was a vast network, with nearly 200 miles of tunnels. Any facility used by the guerillas -- a conference room or training area -- had almost immediate underground access. 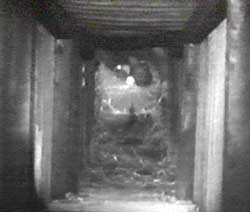 Hidden trapdoors led below, past guarded chambers, to long passages. At regular intervals, branches led back to the surface and other secret entrances. Some openings were even concealed beneath the waters of streams or canals. At the deeper levels, there were chambers carved out for arms factories and a well for the base's water supply. There were store rooms for weapons anad rice, and there was sometimes a hospital or forward aid station. Long communication tunnels connected the base with other distant complexes. Base kitchens were always near the surface, with long, carved-out chimneys designed to diffuse cooking smoke and release it some distance away. Near the kitchens were the guerilla's sleeping chambers, where they could survive for weeks at a time if need be. Everywhere on the top level, there were tunnels leading upwards to hundreds of hidden firing posts for defense of the base.